A blog for diamonds lovers is now born you will find out where they coming from and how much they worth for us. Diamonds are a traditional and conspicuous signal of achievement, status and success. Diamonds are found in alluvial formations and in volcanic pipes, filled for most of their length with blue ground or kimberlite, and igneous rock consisting primarily of serpentine. Diamonds are still very popular and symbolize many things. Besides these articles facts, "Diamonds are Forever" the famous film, ranks as one of the best on the entire Bond series. The producers originally intended to make Diamonds Are Forever an extensive reboot of the film series to appeal to an American audience. The diamond industry also adopted a voluntary System of Warranties to assure consumers that their diamonds are from sources free of conflict. Today 71 governments have enshrined into their national law the Kimberley Process Certification System, and now more than 99% of the world's diamonds are from conflict free sources. As we all know, diamonds are a girl's best friend, but why are these little, sparkling rocks so precious and in demand? An allotrope of carbon, the diamond is probably the most sought after rock, giving pleasure to those who possess one and extravagance to those who sell them on. 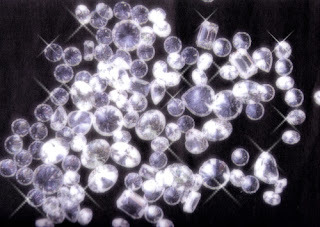 The diamond inherited their name from the Greek word adamas, meaning invincible, and as the hardest known natural mineral to be found in the world they have certainly earnt this reputation. When the diamonds are found they look like tiny, shiny rocks; they can be found in Africa and Brazil (49% originate from here) but have also been mined in Australia, Russia, India and even Canada. Originally adventurers and pioneers would seek this precious material which would bring them great wealth, but as their popularity increased and a market was created for this well sought after jewel, the rock is mined more industriously by large companies. The diamond is a unique stone that reflects light and therefore can generate a variety of different colours, though yellow and brown are the most common. Pure diamonds are colourless or transparent, whilst those that contain defects or impurities often reflect vibrant colours. No substance can have any effect on the diamond which can only be altered when exposed to temperatures of 900*C.
Because the diamond is the hardest substance that has been discovered it is used also in specialized industries to cut hard material or otherwise is crushed and amalgamated in special tools. The stone can only be cut by other diamonds, thus keeping its radiance and shape without being harmed by external components. Hence its popularity for every day wear and use in jewellery. The diamond is often the most preferred of all the gemstones as it remains as bright and full of luster as the very first time it is worn. Over time, this has resulted in it becoming a symbol of love and devotion as the diamond, like a lifetime of marriage, will endure even the hardest of times. Over the years it has had many other associations with it: a symbol of victory and courage; supernatural powers to enchant those who wear it and the ability to act as a magnet for good outcomes. But despite any of these beliefs the diamond remains one of the most attractive gemstones available and averaging at about $55,000 for a 1 carat round modern brilliant cut diamond, D colour, IF (internally flawless) clarity, well proportioned and well made it also remains one of the most expensive!